Major Google Update 16th June — HTTPS Boost? With one of the biggest SERP Fluctations ever reported, all signs point to Wikipedia changing to HTTPs and a possible boost to other HTTPs websites. Published: Jun 18, 2015. 12:14 +0100. Current: Major Google Update 16th June — HTTPS Boost? Something is afoot, and whatever it is, it is big. According to MozCast Weather, it is showing 102 degrees for the 16th June which is the highest ever recorded. The fluctuations were first picked up by Seroundtable, who subsequently labeled it “The Colossus Update”. One thing is for sure; there is a distinct lack of chatter by those hit by a Panda penalty sufficient enough to rule this out, even if such an algorithm refresh is expected in the next few weeks. Sometimes the only way to get to the bottom of a major update is to look at the data to find which websites are moving up or down in the SERPs and look more deeply at the differences between those websites to determine the cause. The gossip in the SEO community can quite often help focus your attention on what data to look at, but quite often it is the major companies who have access to the more comprehensive data who spot things first. MozCast 16th June. © Moz. Thankfully, one of the Marketing Scientists at Moz (Dr. Peter J. Meyers) did indeed spot something. Let’s take a look at what he found, and then take a look at a few additional signals that support his hypothesis. 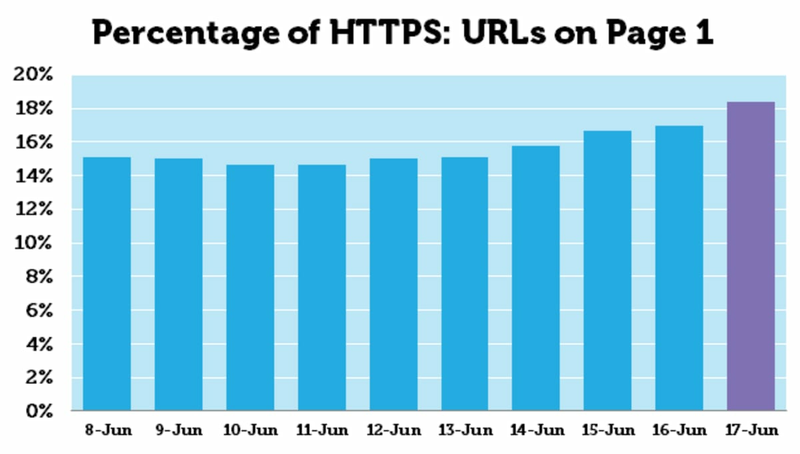 The number of HTTPS URLs on the front page of the SERPs jumping from 16.9 percent to 18.4 percent, with some smaller increases also on the previous days. 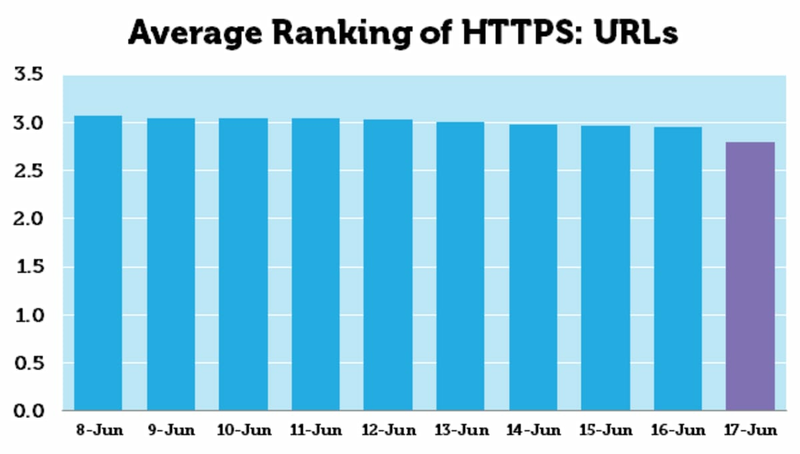 The average ranking of HTTPS URLs dropped from 2.96 to 2.79. Percentage of https on page 1. © Dr. Meyers. Average ranking of https urls. © Dr. Meyers. I have been watching some upheavals in the Google SERPs since Friday, June 12. At first it looked like normal Google fluctuation for the weekend. The Algoroo for the 12th was 1.76. Up until today it slowly tapered off to 1.22. Today the Algoroo rose to 1.95, which is just under the up updates of May 3, 2015 and April 26, 2015. What I have been seeing is de-ranking of inner pages, but there appears to be something else going on. Any Ideas? With Wikipedia being such a large website with many high ranking pages it is only natural that the average rankings \ stats relating to HTTPS would have changed. This does not necessarily mean there was an update. Wikipedia is big enough to cause such fluctuations on its merit, especially if it has the benefit of a previous HTTPS ranking boost. Google has apparently made it known that this update is not Panda (content quality algorithm), and John Mueller has already said that there is a small boost for websites using HTTPS and that the boost may increase in the future. So I think first off it’s important to keep in mind that this is a fairly small change at the moment. So it’s not something where you would see a jump from number 10 to number one immediately. And on the other hand, this is also something where I think the long-term trend is just going to be toward HTTPS. So in the long run, it’s not going to be something where users will go to a website and say, well, if only this website were available in an unencrypted, insecure way, then I’d love to visit it more often. Because there’s really no downside to implementing HTTPS once you have that set up. It’s something that helps your users, that helps you — because you know the content that you put online is the content that the users see. So it’s something where I think that the general move is just going to happen more and more in that direction. I imagine over time, you’ll see that this factor is something that we can improve on and where we can say, well, it really makes sense to kind of push this a little bit more so that we can perhaps count it a little bit higher in the rankings. So it’s something where I imagine over the long run, you’ll see a bigger change than you would see immediately at the moment. So while all the data so far seems to indicate that the cause of the fluctuations by the SERP trackers was caused by HTTPS, it is unclear if the HTTPS algorithm has been boosted. Dr. Meyers states that it is possible that because Wikipedia has now gone HTTPS, it gives them more comfort in giving the HTTPS algorithm more effect. What we think is telling is that both domain diversity and the influence by the big ten has mirrored the changes we have seen above. MozCast domain diversity. © Moz. MozCast top 10. © Moz. It just seems to us that the scope of this update can’t only be explained away by one website, big though it may be, changing to HTTPS. It is also unclear whether there was an actual boost to the HTTPS algorithm even though a few people suspect that is possible. Gary Illyes, webmaster trends analyst at Google, has indicated that the recent SERP fluctuations have nothing to do with HTTPS. What we may be seeing is various factors at play with the Wikipedia HTTPS implementation helping to mask the wider update. The new theory is that this update boosted News related websites. You can read more about that here.